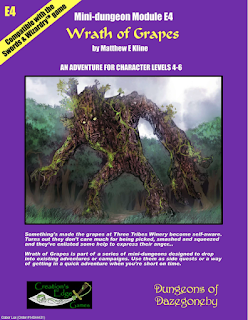 As I have written before, writing mini-adventures is a tricky thing, and I have come to the opinion that many more people can write a decent medium-length scenario than a small one. The balance between rich content and terse prose needs both talent and practice to achieve; no surprise, then, that so many people who try end up failing. Wrath of Grapes is a mini-adventure from Creation’s Edge Games, who now have 34 S&W-compatible scenarios up on RPGNow. I picked up two with an interesting premise to familiarise myself with their output. This adventure starts with a creative and original idea I’d be really proud of if I came up with it. Three retired adventurers mistakenly establishing an exclusive vineyard and stirring up forces which first result in superb wine with random magical effects, then take over their operations. A lost wine collector sought by his irate wife. That’s a great start if there ever was one. What we get instead is an overwrought introduction that could be summed up in one column without missing out on anything important, followed by a 7-page hackfest in a humdrum winery occupied by a bunch of vine monsters. Nothing is actually done with the grove beyond having a bunch of new monsters to fight, and some (admittedly interesting) magical plonk. There is not even a wilderness segment, only the winery, with a few over-written encounters in 12 keyed areas. You know the sort: “The foot locker holds some clean clothes, bedsheets, and assorted personal items.” “The double doors in the west wall conceal a closet holding a variety of tools for doing minor repairs on wine barrels.” Not much to do except meet rampaging vinelings, or rescue the hapless owners and their guest. The map, made with some kind of tile-based mapping programme, is barely readable when printed in greyscale. The rewards for the expedition, some 6200 gold pieces, seems unearned. This is one splendid idea spun into a fairly dull one-note affair. You could spin these ideas into a funny, magical, and maybe darkly grotesque adventure, with enchanted vineyards, haunted cellars and a winery/grove at the middle of it. The material should practically write itself, just go wild with your imagination. This obviously didn’t happen here. Keep the adventure seed, and write something better. 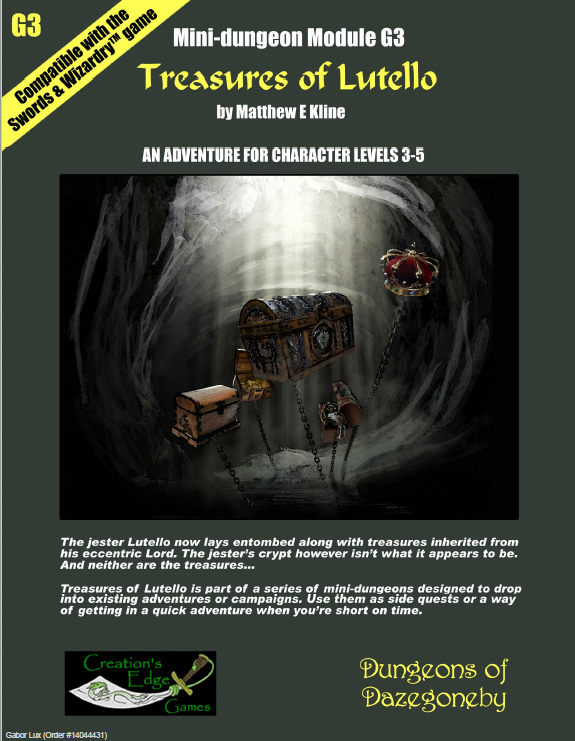 Treasures of Lutello is a small tomb-robbing scenario, with a twist: the tomb was constructed by a jester to have a laugh at the expense of self-important adventures. The result is a short, linear mini-dungeon with 10 keyed areas, using a Dyson Logos map as a base. Similar ideas were sometimes explored in 2nd edition AD&D (the poncy jester edition), most successfully in Deadly Treasure from Dungeon Magazine #41, where an archmage’s magic items were fashioned into elaborate dungeon traps in a great take on the Tomb of Horrors trap dungeon formula. This scenario is a lot more modest, and the traps are more annoying and random than deadly and systematic. It is mostly a series of carnival tricks: the more annoying sort reduces the players to passive observers while having a laugh at their expense, while the better ones are somewhere between oddball randomness and straightforward encounters with a wacky veneer. There is a talking hand puppet dragon, a colourful combat encounter with wooden puppets dressed as brigands, a magical lake you can dive into, but it is more bang than actual substance. At the end, there is some treasure you’d expect to find in a jester’s tomb (actually, a whole pile of 23 low-rent magic items dumped in the characters’ lap – ranging from the invisible whoopee cushion to a scabbard that turns blades into rusty junk). The best part is the very first encounter, a massive sneezing dust trap combined with a gang of irate bugbears, which should allow the players to kill themselves in entertaining ways. Like Wrath of Grapes, Treasures of Lutello is built on an idea that’s not half bad, and it is easily the better of the two modules – more imaginative, more magical and more fun. But if it feels like something is missing, you’d be right: it is still very far from a well-rounded, imaginative scenario that’d make for a great evening’s worth of play. Trap- and trick-based dungeons should reward clever ideas and improvisation, and that element is missing here in the randomness. The scope is too small: it never feels like a properly expansive dungeon, while it lacks the punch of a nice, dense lair encounter. These two adventures feel too much like 2e filler from Dungeon Magazine’s Side Treks series. No playtesters have been listed for this module either. Do you mean this was unintended?